Steel is an excellent building material, it’s strong, durable and highly versatile. However, did you know it also has excellent green credentials? With the myriad of benefits that steel offers, unfortunately its environmental benefits are often overlooked. So what are the environmental benefits of steel? Well, they centre on the recyclability of steel compared to other building materials. Unlike other materials, steel can be recycled indefinitely without ever losing its performance. So there is no limit on how many times steel can be recycled and used. Every year 500 million tonnes of steel is recycled. That is the equivalent of 180 Eifel Towers a day! When it comes to recycling steel the EU is leading the charge where 99% of all waste steel from the construction industry is reclaimed and reused. The success we have had in reclaiming steel means that on average 60% of all “new steel” manufactured is made up of recycled content. 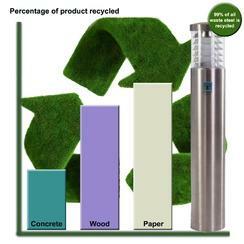 Using recycled content saves energy and dramatically reduces the amount of CO2 created by the manufacturing process. So there you have it! Steel really is a green product. But why should you use steel over other materials in your next project. Because steel is versatile and durable! In the world of street furniture the abundance of steel showcases just how versatile it is. At AUTOPA the majority of our products are manufactured using steel - be it stainless, or galvanised mild steel. Therefore we are well placed to understand all of its advantages.